Bacon. BACON!! I love it. But I have yet to find a good, quality low Points bacon that I truly adore. Until now, that is. I’ve been in love with their hot dogs for sometime now, but they’ve really stolen my heart with their incredible bacon! 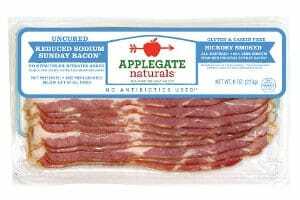 Applegate Reduced Sodium Sunday Bacon is not only delicious, but it’s all natural – no nitrates and no added nitrates. It’s also lower in sodium than regular bacon, and is just 2 Points for 2 slices. No need to wait until Sunday for this incredible, low Points bacon! At just 2 Points per serving, you can enjoy Applegate’s Reduced Sodium Sunday Bacon any day you want! I’ll be using this Fabulous Food Find in all my Weight Watchers Recipes that call for bacon from now on. Where did you find this ? It isn’t a product listed on their website? Is it new?